Jonathan Esquivel is a case study in pelvic reconstruction. When surgeons who have seen the x-rays of his injuries learn that the man is walking, even running, they are dumbfounded. 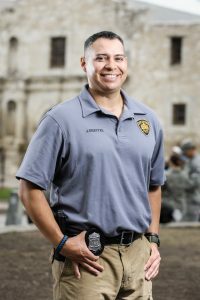 “They assume I’m in a wheelchair, if not dead,” chuckles Jon, a San Antonio Police Officer who had been patrolling the site of a traffic accident when a truck slammed into him at 55 mph. 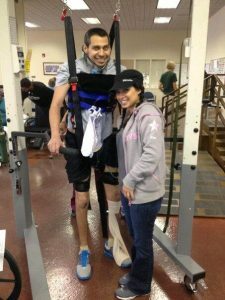 Injuries severe enough to require three plates are normally not survivable; Jonathan needed nine plates to hold all the pieces of his pelvis together. It was a surgery no one had ever attempted before. Dr. Ravia Karia, then completing his residency at the UT Health Science Center in San Antonio, said he had never seen injuries as severe as Jonathan’s. He had a broken hip socket, and his pelvis had shattered into too many pieces to count. It was Dr. Karia’s job to strategize and perform the surgery that would put Jon back together again. Once the surgeons stabilized him and took stock of the surgeries Jon would need, they worried about the inevitable complications—infections, bed sores, issues with ventilation. Too often, post-operative complications lead to death after a patient has survived the initial bodily injury. had never thought about before—like putting on socks. But the most difficult part of the recovery was speech therapy. Jon found it incredibly frustrating to relearn how to speak and to work on strengthening his short-term memory, which had been erased due to his brain injury. It caused him a great deal of anxiety. One thing he wishes he’d known earlier was how much help a psychologist could offer. “I wish people had told me to talk to a psychologist earlier—he gave me a better understanding of the effects of the nerve damage and calmed my anxiety.” He also suggests that more research on nerve injury and nerve pain could be very beneficial for patients like him—he’ll be managing pain for the rest of his life because he does not want to become dependent on narcotics.